Texas Death with Dignity advocates for end of life options and supports an aid in dying law in Texas, based on the Oregon Death with Dignity Act. We believe that every effort should be made to improve and expand hospice and palliative care in our state. However, we also believe that end of life care should be patient centered and if a competent adult patient who is terminally ill and facing a protracted and inevitable death would like to access physician assisted dying to avoid unendurable suffering, they should have the right to do so. We advocate through presentations, our Facebook page, media interviews and through newspaper opinion articles and Letters to the Editor. We need your help to get legislation passed in Texas. 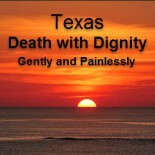 If you agree that Texas should have a death with dignity law, please contact your state representative and state senator and ask them to support a physician assisted dying law. Click on this link to find out the name of your state representative and state senator and their contact information. This advocacy was founded by Cindy Merrill and Penny Shelfer in 2013. We are local advocates for the Death with Dignity National Center. Everyone should have the Right to death with dignity. Texans, please show your support. The only tattoo I have ever wanted is “DNR” on my chest. I am terrified of ending up in a helpless,lingering state. I feel assisted dying is not murder, but rather compassionate and humane. Please join me in convincing our representative of the same and to enact Death with Dignity legislation. A very dear friend of mine hung himself in his home because he was in a painful decline from physicsal aliments related to a broken neck and paralysis. His chosing this option to die alone without the support of loved ones is tragic. We must do better as a people and offer humane ways that empower the individusl to choose this transition option with dignity!